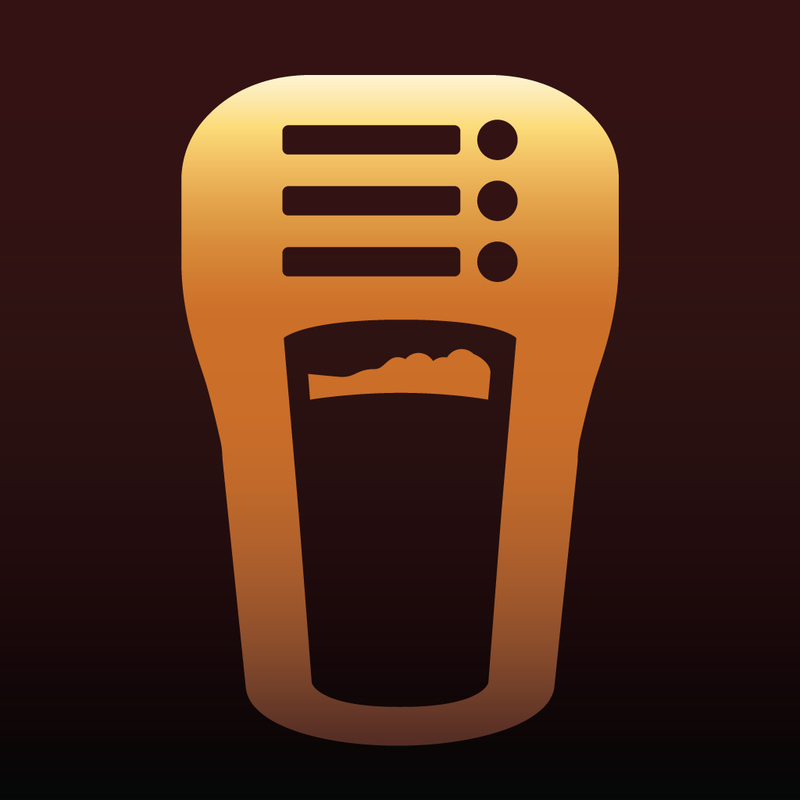 TapCellar - Beer Finder, Check-In, Logging and Journaling Your Craft Brews ($4.99) by The Gravity Well Group is a powerful app for the craft beer drinker. 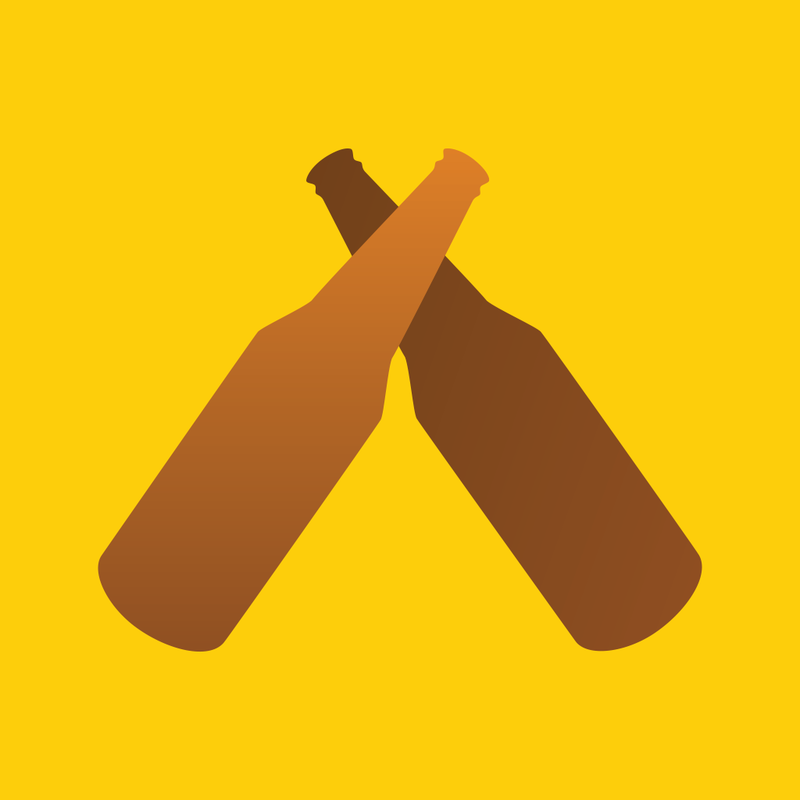 If you love craft beers, and have been looking for an app to help you keep track of what you’ve tried, what you want to try, what’s in your cellar, and what’s on your shopping list, then TapCellar is for you. 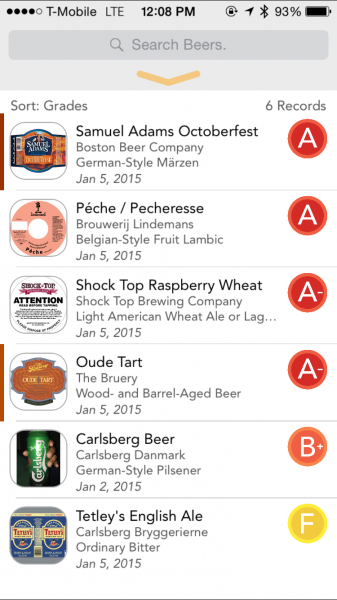 It is similar to other recent apps like BeerTab, except for the fact that it does a lot more than just give your brews a rating. After a long and hectic day, I think we can all agree on one thing: the best way to unwind is with a fine brew (or wine if beer isn’t your thing). I don’t drink too often, but when I do I prefer to find an interesting craft beer, instead of going for those cheap and common “party” beers like Coors and Bud Light. In fact, I don’t have much tolerance for those anymore after trying various craft beers with my boyfriend, so they’re out of the question. 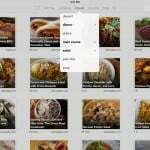 I’m on a goal to try even more this year, and I figured I could use an app like TapCellar to help me out with this. 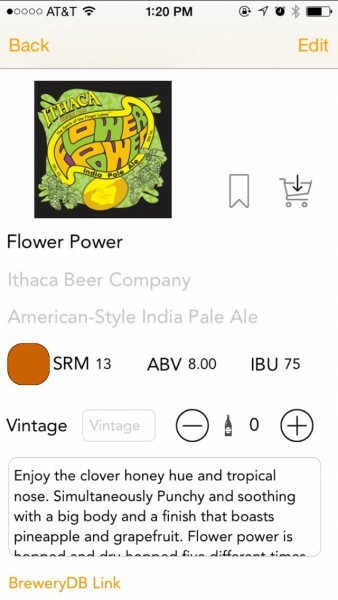 TapCellar has a simple and elegant look to it, though it does take a bit of getting used to due to the powerful features that the app has over the competition. There is a tutorial popover that explains each screen of the app, and I recommend giving it a look instead of skipping over it, because you may end up confused otherwise. Aside from a great design, TapCellar makes great use of color for grades, and beers are easily recognizable if you have them added to your shopping list or bookmarks. The typography used (Avenir) also looks beautiful. If you’re a fan of apps that look gorgeous but pack a powerful punch, then TapCellar will fit the bill perfectly. There are several different uses to TapCellar, which I have already mentioned: journaling and grading, bookmarking, shopping list, and cellar inventory. The developers also threw in a few fun things, like Pretty Things and Victory Brewing, and the other option you can do is view their entire database of over 33,000 craft brews. All of the data is stored locally (hence the 106MB app size), so you don’t need a data connection to find a brew. However, if you are interested in checking in to Untappd or getting more info from other included sources (BreweryDB, BeerAdvocate, and RateBeer), then you’ll need to be connected, of course. 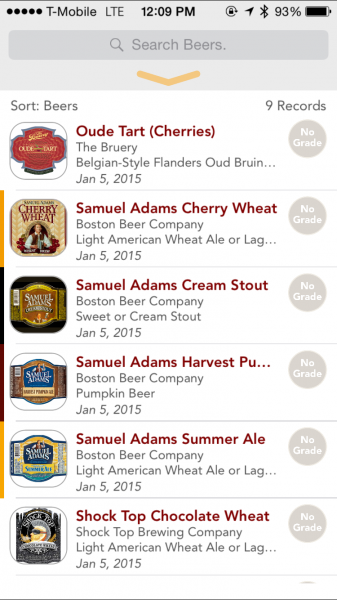 By default, the main view you’ll be on in TapCellar will be the full list of brews. If you are looking for something in particular, just begin typing in the name in the search bar at the top. Unfortunately, the app does not search in real-time, so you need to manually submit it before getting results. 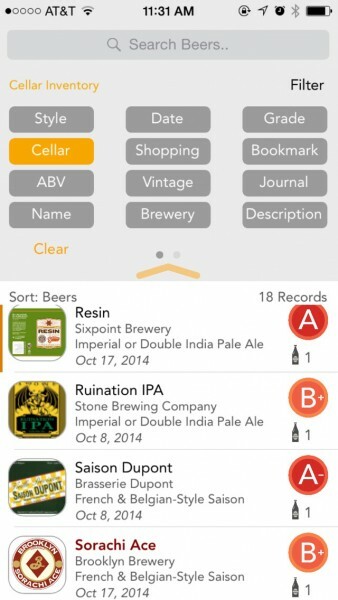 TapCellar returns a list of results to you, and if you see what you want, just tap on it to bring up the details. 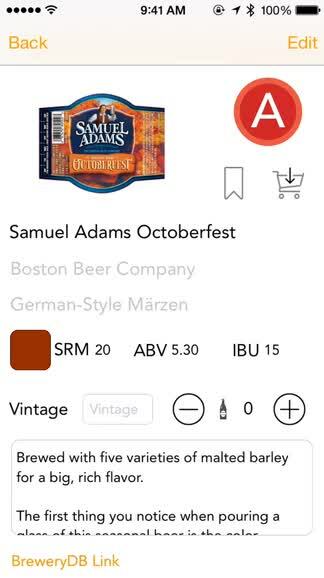 A swipe to the right on a beer reveals a contextual menu, where you can quickly add it to the shopping list, bookmark it, add a new journal entry, and add how many bottles you’ve drank. 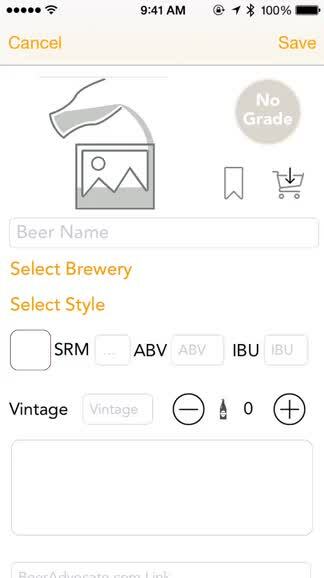 The beer detail screen will display a label image (if available), brewery name, SRM, ABV, and IBU values, vintage, specific notes, and links, though the database may not have every bit of information available. 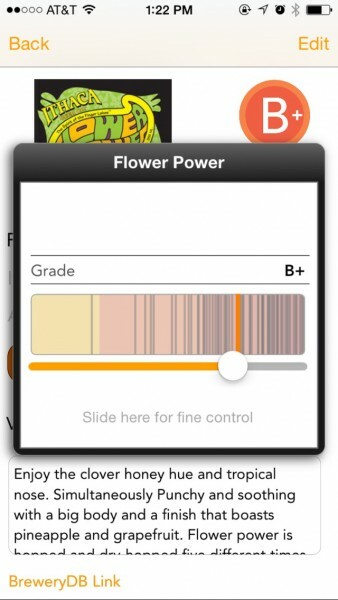 Now, the best part of this view is the Beer Journal, which allows you to keep track of your tasting notes, location, add a photo, copy details to the device clipboard, give it a grade (uses a slider and has – and + grades), and sharing options. Other choices for the beer drinker are to add a brew to their shopping list (cart), or bookmarking it for later. 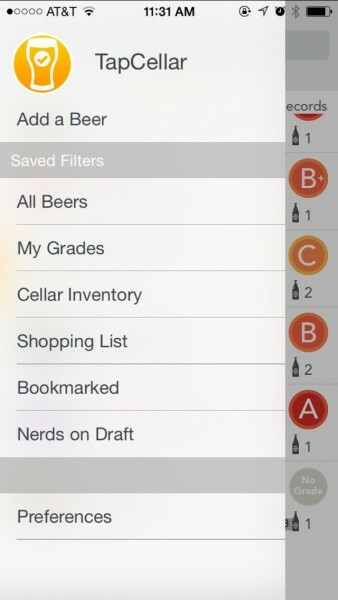 When you want to filter the beer list to show just your bookmarks, shopping list, or graded beers, just swipe in from the left screen edge to access the side panel navigational menu. The Saved Filters include the default presets, and if you can’t find a brew in the database, you can always manually add it yourself. But what if you want to create your own new filter? TapCellar lets you do that too. On the main list, you can tap on the chevron at the top to reveal two pages of different filter labels that you can use. To put one into effect, just tap it — multiple ones can be used at the same time for refined results. 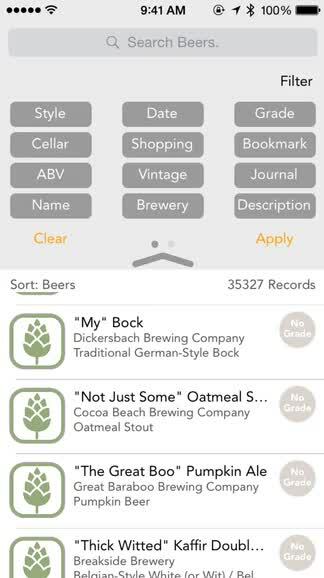 When you’ve made your selection of filters, just tap on “Apply,” and TapCellar will only show the brews that meet your criteria. You can save these results for reference later too by tapping on “Save.” Don’t need the filters anymore? Just tap on “Clear” and it will go back to all beers. 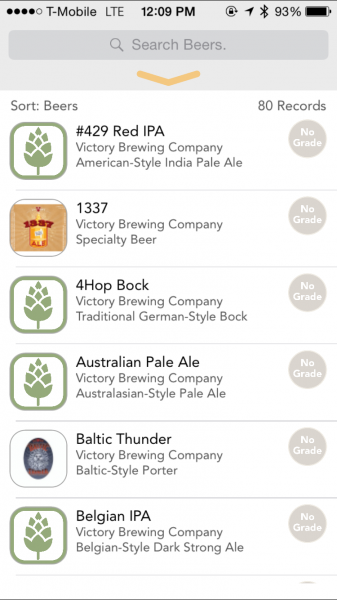 TapCellar also has preferences, which are accessed from the side panel menu. From here, users can edit their saved filter presets, choose sync preferences (database is synced with BreweryDB, which is updated daily), and even backup the database to transfer to another device later. There is also an option for clearing out the temporary images, if you prefer the app to be a bit faster. So far, after getting used to the app, I have to say, TapCellar is now my favorite little app for keeping track of what brews I’ve drank and what I need to try. 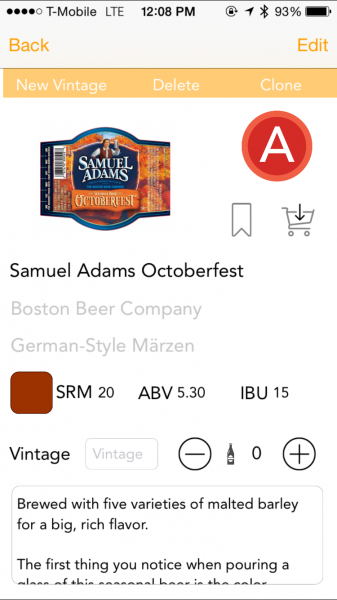 The app is visually appealing, has plenty of powerful filters, is packed with details, and is constantly updated with the latest craft beers. Plus, it’s only social when you want to be social. 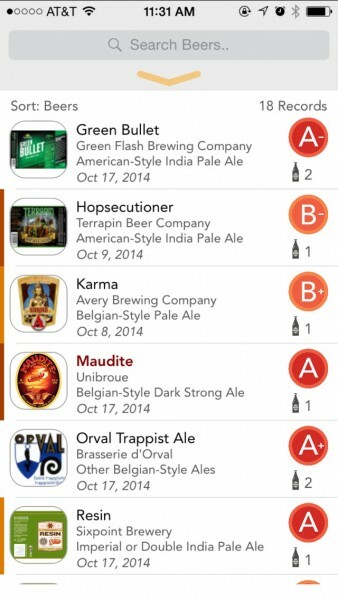 Other apps I’ve tried only let me rate what I’ve tried, but TapCellar does that and lets me explore the huge world of craft beer on top of that — this is great for discovery. If you’re a beer drinker, I highly recommend giving TapCellar a try. 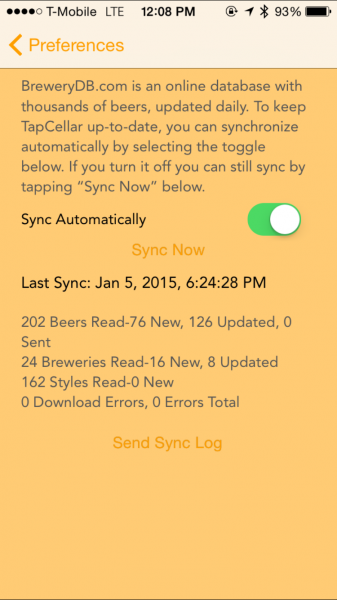 It’s an app for beer nerds built by beer nerds. 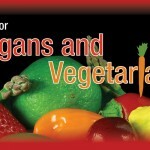 You can get it on the iPhone App Store for $4.99.